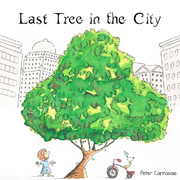 There is one word for Peter Carnavas's Last Tree in the City; outstanding. The story is beautifully simple. Edward lives in a beige world of 'concrete and cars' where, for a few moments each day, he finds refuge in the tree at the end of his street. It is the last tree in the city. Edward is shattered when the tree is cut down but when he discovers a small branch, plants, waters and nurtures it, the city ultimately undergoes an environmental transformation bringing life and joy. Last Tree in the City is a reminder that individual efforts can lead to great changes. The uncluttered illustrations complement and extend the story. With plenty of white space and the use of bright colour restricted initially to Edward, his bike and duck, and the tree, the reader's focus remains on the little boy and his reactions. Carnavas has managed to portray emotion with a brush stroke or two. The illustration of Edward when he finds the tree gone is heart wrenching. Importantly for young children, the text, and illustrations in particular, finish on an inspirational and hopeful note. Last Tree in the City brings to my mind two of my favourite picture books of recent years: Bob Graham's How To Heal a Broken Wing and Stephen Michael-King's Leaf. Peter Carnavas is bound to be around for a long time to come and I am sure he will continue to garner awards for his exceptional work.